As our November Amazing Kid! of the Month, Amazing Kids! is delighted to present the story of one truly amazing and talented young drummer and inventor Julian Pavone. From the Motor City, (Detroit, Michigan), five-year-old Julian began his professional music career at just 19 months old! Since then, he has performed in international venues and has been featured on numerous television shows and news shows. Unsurprisingly, Julian’s amazing talents in both music and inventing have earned him numerous awards. Even at a young age, Julian was passionate about drumming and with his parents support, worked very hard to nurture his talent for both drumming and inventing. We hope that Julian’s story will inspire our young readers to work hard at their goals too, and will inspire more parents and caring mentors to nurture their children’s talents, so they can one day realize their amazing potential and launch their dreams! After all, that’s what Amazing Kids! is all about. He is the youngest professional drummer in the world. He is five year old Julian Pavone of Detroit, Michigan. Julian started playing drums from the age of three months. 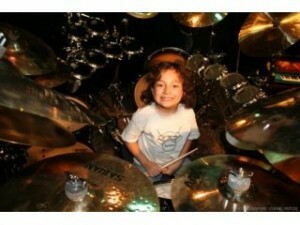 Now, just 5 years old, he plays a 22-piece custom drum set with 17 cymbals and a double kick. He plays rock, funk, fusion and jazz beats with his Vic Firth Signature Series Sticks on Ddrums, Sabian Cymbals and Sennheiser Microphones – with all told, four companies supporting him with full artist endorsements. “Julian’s talent is obviously a God-given gift. He amazes us daily even though we have witnessed this talent grow and evolve since he was an infant. 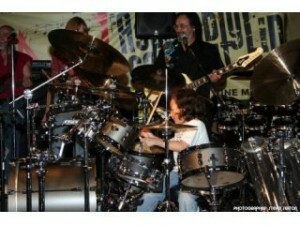 Julian also works very hard, practicing up to two hours per day, with his talent. His talent is beyond comprehension, but we know our role is to nurture it and support it the best we can,” says Julian’s father, Bernadino Pavone. When Julian was 15 months old, he auditioned for the Cleveland Cavaliers’ Drumline. The founder and director of the drumline, William Winfield, III, thought he was actually 15 years old when he had first agreed to see Julian audition! When he met Julian and found out he was only 15 months old, he went ahead with the audition anyway, and afterwards, made him the youngest member of the group, by 16 years! Soon after, Julian performed with the drumline for the Cleveland Cavaliers’ quarter time show, and the rest as they say, is history. Julian (center) with his younger sister, Annalisa (left) ...and friend, Megan! Apart from his love and gift for drumming, Julian is a regular kid, a kindergartener who loves cartoons, superheros, playing outside and being with his friends and family. Musically, he also likes to sing and play guitar, and is taking lessons in each. He also dances, currently studying tap and hip-hop. Julian’s talent has been recognized by critics and media alike. He has appeared on more than 100 television and news shows including The Oprah Winfrey Show, Good Morning America, MSNBC, Fox News Dayside, and The Maury Show, to name a few. He has performed live on numerous radio stations around the world. He has given live concerts at several venues around the country, including the legendary Whisky A Go-Go, House of Blues and Hard Rock Café! He has performed for the Detroit Pistons, Detroit Tigers, Cleveland Cavaliers, Cleveland Indians, Chicago Cubs and at the Cleveland Grand Prix. Julian has also starred in a television show pilot, Finding Julian’s Band, created by Rocky Seprino and had a documentary about him produced by Korea’s Seoul Broadcasting Systems. His numerous talents have inspired a series of children’s books, and the development of his own signature pasta, “Julian’s Mac and Cheese!” He has influenced the launch of his own clothing line, and at the tender age of 4 has invented and received a patent for “Abracadabra” – a Stain Cover-up, making him “The World’s Youngest Inventor”! 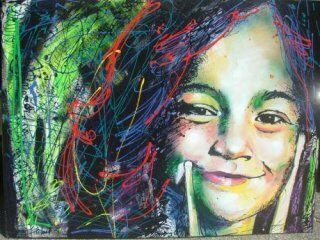 All of these amazing developments have led to the formation by his parents and their business partners of Harmonie Network – a national entertainment and music company which will continue to support the amazing talents of kids like Julian and others. Julian has received numerous honors and awards, including the “The 2007 Rock and Roll Lifetime Achievement Award”, a Special Declaration of Tribute from the State of Michigan. He was also named “A Shining Arab American Star” by the Lebanese American Heritage Club. He has been featured in “Ripley’s Believe it or Not”, and was named Muscular Dystrophy Association’s Honorary Goodwill Ambassador for 2009. Julian is fortunate to have his amazing talents nurtured and supported by a tremendous group of instructors, including William Winfield, III (drums), Dom Famularo (drums), Ron Strnad (drums), Dennis Sheridan (percussion), Francesco Cavallini (voice, guitar) and Ralphe Armstrong (bass guitar). He also attends University Liggett School, a private, college-preparatory day school that is Michigan’s oldest coeducational, independent school. Recently, multi-award winning production company, WonderWorld Entertainment, signed Julian, as a prodigy drummer, to 13 episodes of a new show called All You Need is Music. 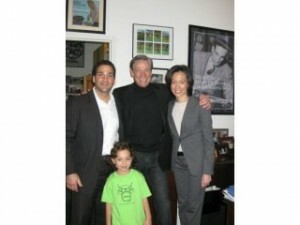 Julian will star in and co-host the show with Michael J. Powell (4-time Grammy Award winning producer). He will travel to major U.S. cities on a quest to find out about the birth and evolution of various types of music throughout the country. In addition, he may now be the “World’s Youngest Entrepreneur!” with the recent debut of his “Go-Baby Fruit Bars ™” – a healthy fruit bar endorsed by his physician mom. Julian helped to perfect the formula and flavors and the bar will join the other brands of Julian Pavone Enterprises, LLC. They will be produced by Michigan Quality Snacks, LLC (Shelby Township, MI.). 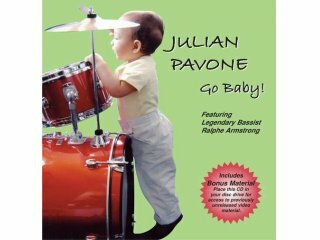 To learn more about Julian, visit www.julianpavone.com or www.littledrummerbaby.com.